When it comes to relationships, ‘ghosting’ is a common term. It has been used for the last few years both in relationships and the workplace to describe what happens when someone shows interest in you, only to stop contact without explanation. They stop texting, don’t show for a date, or refuse to reply to emails. Today, ghosting has been taken to an even more unhealthy level: orbiting. Coined by writer Anna Iovine of Man Repeller, it describes what happens when someone you are dating cuts of contact with you, only to continually monitor your behaviour online. While they may not talk to you anymore, they continually view your Snapchat feed, Instagram stories, and may even like your Instagram pictures, Tweets or Facebook posts. It sounds sort of creepy, doesn’t it? Knowing that I am being watched online, without my permission, feels intrusive and violating. It is as if someone has set up a tent outside my house with the intention of monitoring my every move. At its most innocent, orbiting is perhaps a person’s desire to fill their hours of boredom or satisfy curiosity that can become addictive. Yet it can also run to the other extreme of outright stalking and bullying behaviour. And while social media is often public, this is never an excuse for someone to violate your privacy by instigating such concerning and abusive behaviour. If you realise you are being orbited, you have a choice: to entertain a sense of powerless and even outrage at this blatant violation of privacy, or take back your power and feel more in control. While you have a right to feel angry, each of these behaviours invites further negative interaction from the perpetrator and will actually perpetuate the cycle they have begun. Your response could invite fascination, excitement or stimulation. The best way to retain your power is by choosing to ignore their presence. While it may feel contrary to their behaviour, by doing this you dilute their power and strengthen your own position. 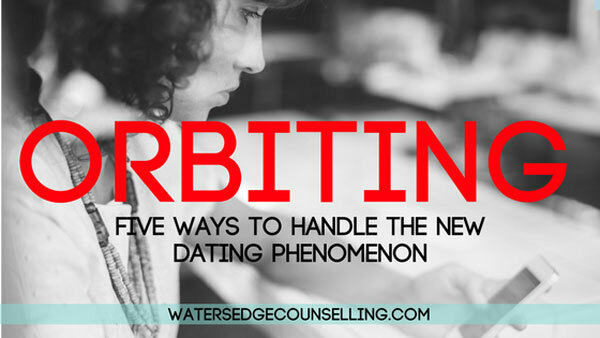 Here are five steps you can follow to take back your control and nip orbiting in the bud. Recognise your power and control. You can keep your power or give it away by choosing to be reactive (stimulating them) or pro-active (blocking them). Don’t be afraid to block or hide a person from seeing your social media content. Think of this akin to putting up a fence around your house. You wouldn’t let just anyone in, so why is your social media any different? If someone is frequently crossing the boundaries and viewing your content or interacting with you, report them. Let the authorities on that particular site fight for you and don’t be afraid to remove yourself from the website, even for a short period, if it’s ruining your quality of life. This approach is only recommended if you feel strong enough to advocate for yourself, as you may very well get negative backlash. Choose your timing and your words carefully. Remind yourself that the boundaries they cross are first of all in your mind, creating fear, anger and frustration. Consider what message does your online presence sends to the world. Try to be honest with yourself and ask: Am I provocative in any way? Am I ambivalent about the attention? Angered by it? Flattered by it? How you portray yourself on social media is never an excuse for someone to orbit you or violate your privacy in anyway, but understanding the image you portray will empower you to create boundaries in the future to protect yourself. Are you being orbited? Is your social media presence causing you anxiety or minimising your quality of life? Contact Colleen on 0434 337 245, Duncan on 0434 331 243, or Rachel on 0422 177 193 for a FREE 10-minute phone consultation on how we can best help you, or press book now to book on our online diary.